California Chrome, a horse from the humblest of origins as the son of a $2,500 sire, overcame a slipping saddle and tore the field apart here on Saturday night to win the $10m Dubai World Cup, the richest race of the season, by three-and-three-quarter lengths in a course record time. 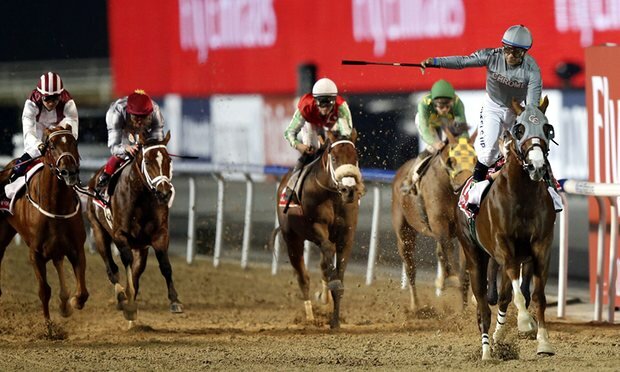 Victor Espinoza, California Chrome’s jockey, said he felt his saddle starting to slip at an early stage but he steered the 2014 Kentucky Derby winner to an emphatic success. The winner powered into the lead halfway down the stretch, and while his saddle was now some way back towards his hindquarters, no encouragement was required from Espinoza as California Chrome coasted to victory ahead of Mubtaahij and Hopportunity. California Chrome finished second behind a surprise winner in the same race 12 months ago, and the $6m (£4.25m) first prize for going one better on Saturday took the five-year-old’s career earnings to $12.5m. It is a record for an American-trained horse, and nearly $4m more than the career total of American Pharoah, the horse Espinoza rode to win the Triple Crown last season. The money, though, will be a secondary concern for the “Chromies”, the huge fanbase in the United States that has taken the homespun hero to its heart. Art Sherman, who saddled the winner, became the oldest trainer to win the Kentucky Derby at the age of 77 when California Chrome triumphed two years ago, and though his attempt to win the Triple Crown came up short in the final leg, California Chrome’s popularity has been growing ever since. “At the second turn I felt the saddle slipping backwards,” Espinoza said. “I thought, ‘uh-oh’. Down the stretch it got worse and worse, and I thought, where’s the wire? “I didn’t want to get out of balance, because it wouldn’t have been pretty. Sherman, a former jockey who also rode work on Swaps, one of the great Kentucky Derby winners, paid tribute to Espinoza’s skill. “Victor did a fabulous job,” Sherman said. “I rode for 23 years, and when your saddle slips it makes you move backwards on a horse, you have to keep control. California Chrome was aimed at Royal Ascot after his second-place finish here last season, only to be scratched from the Prince of Wales’s Stakes because of injury shortly before the race. This year, however, he may have only two more runs before being retired to stud, with the Pacific Classic at Del Mar in August and then the Breeders’ Cup Classic, at Santa Anita in November, nominated afterwards as targets by Perry Martin, his part-owner. Roger Varian set himself up for the new European Flat season when Postponed recorded the most valuable win of the trainer’s five-year career with a comprehensive success in the Dubai Sheema Classic. Postponed, who joined Varian’s yard last September following a high-profile splitbetween Sheikh Mohammed Obaid, his owner, and Varian’s fellow Newmarket trainer Luca Cumani, set off as the favourite and was as good as home from the moment he hit the front, halfway down the straight. Postponed powered clear under Andrea Atzeni, who was celebrating his 25th birthday with victory in a race worth £2.5m to the winner, and finished two lengths ahead of Duramente at the post. Varian’s string has expanded rapidly in his relatively brief career with a licence and following the arrival of Postponed, he has a ready-made contender for a string of Group One middle-distance races over the next seven months. Ryan Moore rode a flawless race on Real Steel in the Dubai Turf and secured a double for Japanese-trained horses on the night, seizing the initiative a furlong out to beat Euro Charline by half a length with Tryster, the favourite, another two lengths away in third. Moore has forged some impressive alliances in Japan in recent seasons, and took the Japan Cup, the country’s biggest race, on Gentildonna in November 2013. In prize-money terms, however, this was the most valuable success of Moore’s career, worth £3.6m to the winner, and surpassing the purse of around £2m for his wins in the 2010 Prix de l’Arc de Triomphe and 2015 Melbourne Cup. Tryster, last year’s Easter Classic winner on All-Weather Finals Day at Lingfield, was the favourite for the race, but even his exceptional turn of foot could not close the gap to Real Steel after he turned for home at the back of the field. He finished fast into third, while Euro Charline, from Marco Botti’s Newmarket stable, was second. There was an impressive global spread among the winners on the early part of the card, with Australia recording only its third success on World Cup night as Buffering finished three-quarters of a length in front of Ertijaal, the favourite, in the Al Quoz Sprint. Buffering is a veteran of the Australian sprinting scene who made the frame behind the legendary Black Caviar three times in the early part of his career. He was the only horse to travel to the meeting from Australia this year, but was accompanied by a large party of supporters to roar him on and even Meydan’s oversized platform for the presentation ceremonies was barely big enough to accommodate them all. France got on the board in the Dubai Gold Cup when Alain de Royer-Dupré’s Vazirabad overcame a slow start to edge past Michael Bell’s Big Orange, fifth home in last year’s Melbourne Cup, well inside the final furlong. This was a Group Two event, but it was still possible to imagine both the winner and runner-up running well in the Gold Cup at Royal Ascot in June. Vazirabad was ultimately a comfortable winner on the night, but he was getting about 5.5lb from Big Orange, and the pair are now top-priced at 8-1 and 16-1 respectively for the royal meeting’s feature event.